"It is widely recognized in the medical profession that a healthy and clean colon is one of the most important precursors to good health and that the great majority of body ailments and diseases originate in an acidic and dirty colon. Water is essential for your health. "Kangen Water is alkaline rich water (ph 8-9), and is considered the very best drinking water because of its incomparable powers of hydration, detoxification, and anti-oxidation." Dr. Hiromi Shinya is Clinical Professor of Surgery at Albert Einstein Collage of Medicine and Chief of the Endoscopy Unit of Beth Israel Hospital in New York, as well as an advisor for Maeda Hospital and Hanzomon Gastrointestinal Clinic in Japan. A native of Japan, Dr. Shinya received his medical education both in Japan and in the United States. He is Japan's most famous doctor and treats members of Japan's royal family and top government officials. His practice in the United States also includes celebrities and Presidents. He is Vice Chairman of the Japanese Medical Association in the USA, and much in demand as a speaker internationally. "When I first drank Kangen Water I experienced something I had never have before, I liked it, I liked it very much. ... As I investigated the product, as I investigated the concept of ionized water, as I investigated the concept of alkalization of the body cells, I became more and more convinced that this is a product that is of absolute value to all mankind. That it is a product that should be used in all households if at all possible, because it clearly is superior to any form of water than I ever encountered." "Personally, I can testify that there is no question that my own life has been markedly enriched by the ingestion of Kangen Water. .. I endorse Kangen Water as a physician, as a surgeon, as a human being, 100%. I feel that it is of great benefit to all mankind. ... I can only recommend it in the highest way." programs we observed that our therapeutic expectations have been significantly exceeded by adding Kangen Water™ to the treatment plan. "This [alkalizing] program contains a whole new way of looking at diet and nutrition. When followed, it leads to a healthy, lean, trim body and an enhanced level of wellness, energy and mental clarity most people have not experienced previously. " "Based on years of research and observation, we have concluded that over acidification of the body is the underlying cause of all disease. Because many people consume a diet primarily comprised of acid forming foods, (i.e. sugars, meat, dairy, yeast breads, coffee, alcohol, starches, etc.) rather than whole plant foods, they are frequently sick and tired"
"In my experience, Kangen Water™ supercharges your nutritional program better than anything. Water is the key and this [Enagic® Kangen™ Water] is the best water I know of. Anyone who gives it an honest try will experience it in their own health, without question!" "Acid wastes build up in the body in the form of cholesterol, gallstones, kidney stones, arterial plaque, urates, phosphates and sulfates. These acidic waste products are the direct cause of premature aging and the onset of chronic disease." 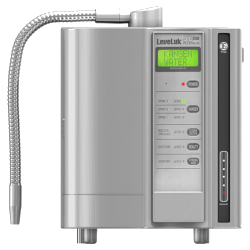 "I believe that the best water is water that is alkaline (reduced) and purified using a small device known as a water ionizer." Dr. Stefan Kuprowsky is a Canadian naturopathic doctor with impressive academic credentials and a strong vision for natural medicine. He holds a Bachelor's degree in Biological Anthropology from Trent University (1977), a Master's in Medical Anthropology (1982) and a Doctorate in Naturopathic Medicine (1985). He has been in practice over 20 years as a Naturopathic Physician as well as a consultant, writer, lecturer, radio host and teacher in the natural health industry. He has served as President of the BC Naturopathic Association and is currently serving on the BC College Board as Chairman of the Quality Assurance Committee. He is also a professor at the Boucher Institute Of Naturopathic Medicine in New Westminster. Dr. Kuprowsky has studied mind-body medicine with Deepak Chopra and a certified instructor for Dr. Chopra's Creative Health program. He currently operates the Vancouver Naturopathic Clinic. "Any stressor that the mind or body interprets and internalizes as too much to deal with, leaves an acid residue. Even a mild stressor can cause a partial or total acid-forming reaction. ... The countless names attached to illness do not really mater. What does matter is that they all come from the same root cause: too much tissue acid waste in the body." "It is my opinion that ionized water will change the way in which all health practitioners and the public approach their health in the coming years. ... I have administered over 5000 gallons of this water for about every health situation imaginable. I feel that restructured alkaline water can benefit everyone." "Drinking four to six glasses of alkaline water a day will help to neutralize over acidity and over time will help to restore your buffering ability. Alkaline water should be used when conditions of over acidity develop, such as cold, flu or bronchitis. Like vitamins C, E and Beta Carotene, alkaline water acts as an antioxidant because of its excess supply of free electrons. This can help the body against the development of heart disease, strokes, immune dysfunctions, and other common ailments." "The benefits of the alkaline water created through electrolysis far exceed just its ability to gently raise the pH of the cells and tissues of the body and to neutralize acids. Because the alkaline water has gained a significant number of free electrons through the electrolysis process, it is able to donate these electrons to active oxygen free radicals in the body, thereby becoming a super antioxidant. By donating its excess free electrons, alkaline water is able to block the oxidation of normal tissue by free oxygen radicals." Dr. Susan Lark is one of the foremost authorities in the fields of clinical nutrition and preventive medicine. A graduate of Northwestern University Medical School, she has served on the clinical faculty of Stanford University Medical School, and taught in their Division of Family and Community Medicine. Dr. Lark is a distinguished clinician, author, lecturer and innovative product developer. Through her extensive clinical experience, she has been an innovator in the use of self-care treatments such as diet, nutrition, exercise and stress management techniques in the field of women's health, and has lectured extensively throughout the United States on topics in preventive medicine. She is the author of 13 best-selling books on women's health including The Chemistry of Success. "Scientists now believe that free radicals are factors in nearly every known disease"
metabolic acidosis and improve absorption of nutrients." Dr. Lester Packer, is the world's foremost antioxidant research scientist. He is a senior scientist at the prestigious Lawrence Berkeley Laboratory, and Head of the Packer Lab at the University of California, where he has been a professor for 35 years. Dr. Packer is the executive editor of Archives of Biochemistry and Biophysics, and serves on the editorial advisory boards of Free Radical Biology and Medicine, The Journal of Applied Nutrition, and The Journal of Optimal Nutrition. He is a member of eight professional societies and is President of the International Society for Free Radical Research, and Vice President of UNESCO's Global Network of Molecular and Cell Biology. Dr. Packer has published over 700 scientific papers and 70 books on every aspect of antioxidants and health. available to engage in reactions that neutralize positively charged free radicals. 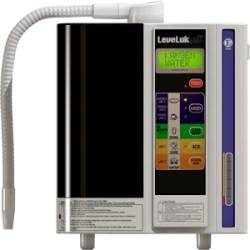 This is the key benefit of water produced by a water alkalinizer that is not available by simply drinking water that has had some bicarb or other compounds dissolved in it to make it alkaline." Prize, the world's largest for innovation. In 1999, he received the National Medal of Technology, the nation's highest honor in technology, from President Clinton in a White House ceremony. And in 2002, he was inducted into the National Inventor's Hall of Fame, established by the US Patent Office. Author of several books Dr. Kurzweil second book in 1993, The 10% Solution for a Healthy Life, How to Eliminate Virtually All Risk of Heart Disease and Cancer, was published by Crown Publishers. "Hexagonal water - comprised of small molecular units or ring-shaped clusters - move easily within the cellular matrix of the body, helping with nutrient absorption and waster removal. It aids metabolic processes, supports the immune system, contributes to lasting vitality and acts as a carrier of dissolved oxygen. It can provide alkaline minerals to the body and it helps in the more efficient removal of acidic wastes. Drinking hexagonal water takes us in the direction of health. It supports long life and freedom from disease. Biological organisms prefer hexagonal water." "Ionized water has a hexagonal shape and carries an abundance of hydroxyl ions (OH-). It provides extra electrons that neutralize destructive free radicals circulating throughout the body. Hexagonal ionized water carries a high negative ORP (Oxidation Reduction Potential) when it is first produced, making it a potent anti-oxidant." "When taken internally, the reduced ionized water with it redox potential, or ORP of -250 to -350 readily donates its electrons to oddball oxygen radicals and blocks the interaction of the active oxygen with normal molecules." "Water has the ability to attract and accumulate bio-energy. It also stores an energy memory of harmful or helpful vibrations to which it was exposed in the past. Chlorinated tap water is polluted with non-biological chemicals and negative energy imprints. It is also devoid of bio-energy and so may be regarded as being badly polluted as well as 'dead'. Alkaline living water is regarded by a growing number of health care professionals as the best water to drink and is listed as a medical device in Japan for the treatment of degenerative diseases." "My hypothesis was born from the clinical observation study in our clinic. Since May '85 we have confirmed thousands of clinical improvements, obtained solely by exchanging drinking (as well as cooking water) from tap water to reduced water." Technology (KIST) in 1969. Then, he joined the Korea Advanced Institute of Science and Technology (KAIST) as a charter member in 1971. Prof. Jhon is a foreign fellow of National Academy of Sciences, India, and Pakistan Academy of Sciences, a foreign academician of Russian Academy of Science and a fellow of the European Academy of Arts, Sciences & Humanities. He published over 280 papers and produced many eminent scholars including about 50 Ph.D.s. He served as President of KAST, Founding President of AASA, Founding President of the Korean Association for the Advancement of Sciences and Chairman of the Board of Research Institute of Bioinformatics and Molecular Design. "Devices to produce reduced water were introduced into our clinic in May 1985. Based on the clinical experiences obtained in the past 15 years, it can be said that introduction of naturally reduced water (using H-01 Active Hydrogen Generator) or electrolyzed-reduced water for drinking and cooking purpose for in- patients should be the very prerequisite in our daily medical practices. It is because any dietary recipe cannot be a scientific one if property of water taken by the patients is not taken into consideration." "The Ministry of Health and Welfare in Japan announced in 1965 that the intake of reduced water is effective for restoration of intestinal flora metabolism." Improvement of so-called specific diseases; Behcet' syndrome, Crohn disease, ulcerative colitis, Kawasaki's disease. "The pH level (the acid-alkaline measurement) of our internal fluids affects every cell in our bodies. Extended acid imbalances of any kind are not well tolerated by the body. Indeed, the entire metabolic process depends on a balanced internal alkaline environment. A chronically over-acidic pH corrodes body tissue, slowly eating into the 60,000 miles of veins and arteries like acid eating into marble. If left unchecked, it will interrupt all cellular activities and functions, from the beating of your heart to the neural firing of your brain. In summary, over-acidification interferes with life itself leading to all sickness and disease!" "Researchers believe that disease is caused by excess acidity in our body that weakens all body systems. Caused by our high stress lifestyles, what we eat and pollutants, it affects virtually everyone. This forces the body to rob minerals - calcium and magnesium - from vital organs and bones. Our reserves are depleted, leaving the body vulnerable to bone density loss, heartburn, indigestion, blood sugar issues, weight gain - 68 conditions in all. When healthy, your body has sufficient alkaline reserves to balance it self - and naturally resists disease. The easiest way to help your body to be more alkaline is to drink alkaline water"
Robert O. Young, MS, D.Sc., Ph.D., N.D. has been widely recognized over the past two and a half decades. Throughout his career, his research has been focused at the cellular level. Having a specialty in cellular nutrition, Dr. Young has devoted his life to researching the true causes of "disease," subsequently developing The New Biology™ to help people balance their life. In 1994, Dr. Young discovered the reality of biological transformation of red blood cells into bacteria and bacteria to red blood cells. He has since documented several such transformations. Dr. Young's research findings have been published in several noted journals, including The Journal of Alternative and Complementary Medicine. (Sympathetic Resonance Technology, Scientific Foundations and Summary of Biologic and Clinical Studies, Dec. 2002, Vol. 8, No. 6: 835-842.) He is the author of numerous articles and author and co-author of many books including The pH Miracle (2002), The pH Miracle for Diabetes (2003), The pH Miracle for Weight Loss (2004). "Months of testing and research have led me to the discovery that drinking Kangen Water™ is the most effective tool I have found to quickly, easily, and economically reduce cellular oxidation and achieve a more alkaline pH in the body." As a Biological Medicine Physician, I have been measuring the levels of oxidation in bodily fluids for about a decade using a very sophisticated piece of lab equipment called the QFA (Quantitative Fluid Analysis). Based on the rate of oxidation in these fluids this measurement device calculates a person's biological age. For most people this biological age is generally 20-50 years older than their actual chronological age. Since it is our biological age that determines the length of our life, that number is quite significant. More than 3 years of testing and research have led me to the discovery that drinking Kangen Reduced Alkaline Water is the most effective tool for quickly, easily and economically changing the rate of oxidation on cells that I have ever encountered." cell wall and allows for better hydration, and cell metabolism and overall cell health." "International studies show that populations with little or no history of illness, such as cancer, drink higher pH (alkaline) waters. After all potential risk factors were considered and factored out, it became evident that they had been drinking waters with a pH of 9.0 to 10.0." "Hexagonal, alkaline water is especially effective in treating those with chronic disease." "Your body thrives in an alkaline environment since it is able to detoxify more efficiently than in an acidic environment. 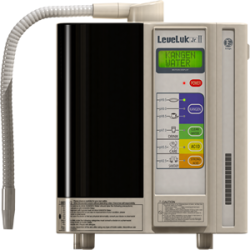 In an alkaline environment your tissues get rid of impurities more efficiently. When cancer patients come into my office to begin nutritional treatment, their bodies are almost always very acidic and toxic. My first task is to get their tissues alkalinized with alkaline water." This Kangen Water technology is truly nothing short of miraculous in my opinion, because it really provides three different very important aspects to our health that I find very intriguing. 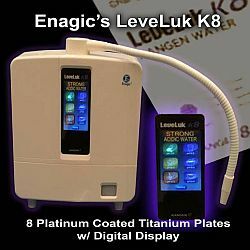 Number one is this machine provides a very high antioxidant based water ... the second thing I am really impressed with is its micro-clustering abilities ... and the third component [its alkalinity], Kangen Water™ is up to a 9.5 pH." "After years of very positive continuous clinical experiment that I am conducting with hundreds of clients using electronically restructured alkaline water, it is my opinion that this technology will change the way in which all health providers and the public will approach their health in the coming years. ... My suggestion is to drink restructured alkaline water whenever possible."